"A Difference Between Night and Day"
his county's emergency alerting initiative. channels used by various entities within the county. Perhaps we can help you do the same. Galain is recognized as the nation’s leading independent consultancy on emergency alert systems and mass notification for public safety agencies, healthcare, higher ed and corporate campuses. Impartial Advice. Strong Results. Clear Guidance. Galain does not sell technology, but instead helps clients select, integrate, and implement emergency alert systems and mass notification initiatives. Galain helps public safety agencies, and corporate/higher ed campuses protect citizens, students and businesses to continue operations in a disaster. Galain has deep knowledge of the FEMA IPAWS program, including Wireless Emergency Alerts & the National Emergency Alert System. Organizations ranging from the Federal Emergency Management Agency (FEMA) to Dane County Emergency Management place their trust in us alone. 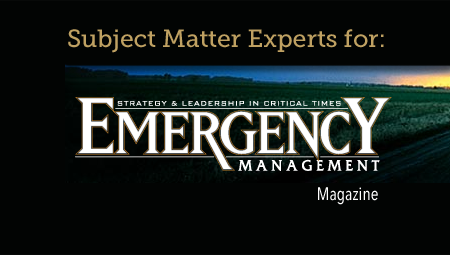 Emergency Management magazine cites Galain’s principals as the country’s leading independent authorities on emergency alert systems and mass notification systems. We know the landmines in developing emergency alert and mass notification programs and we can keep you from making costly mistakes. Join the other industry-leading organizations that choose Galain to help them create successful alert and warning initiatives. Galain Solutions’ mission is to be the world’s leading independent consultancy on emergency alert and warning practices and technologies. The Galain team will provide value by deploying its deep knowledge and experience to help agencies, campuses, and companies to create the best emergency alert and warning program possible. Better Emergency Alerts mean Better Communities. Informed citizens and employees are key to a safer public and faster disaster recovery. The right technologies and procedures can make a difference. We will help emergency managers and business continuity professionals make the best choices for their communities and organizations. What about alerting standards, legacy alerting and risks?